Human rights films brought new perspectives and challenges to Ottawa this weekend, as part of the inaugural University of Ottawa Human Rights Film Festival, which ran from Oct. 24-26. 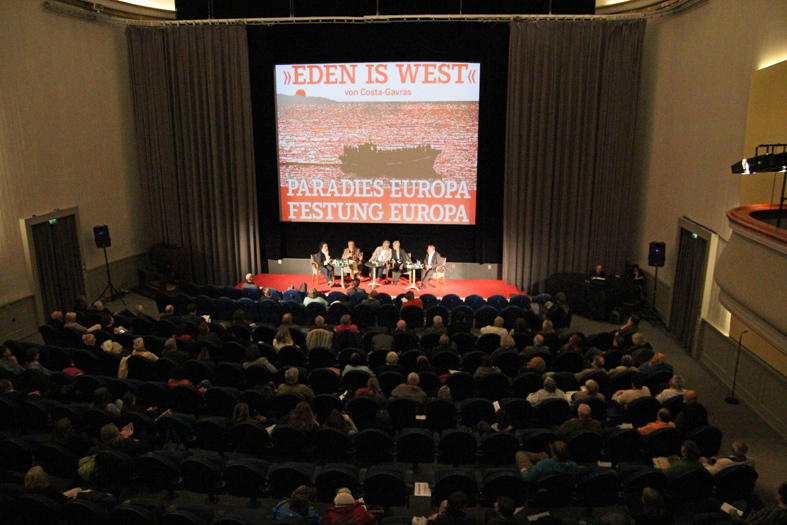 Costa-Gravas talking about his film "Eden is West" in Germany. Photo provided by Magnus Manske. A joint effort between the University of Ottawa Human Rights Research and Education Centre (HRREC) and the Canadian Film Institute (CFI), the festival hosted five fictional and documentary films from Canada and around the world. The films profiled human rights issues such as globalization to political oppression, and emphasized debate and discussion on current human rights issues. Costa-Gravas talking about his film “Eden is West” in Germany. Photo provided by Magnus Manske. The festival’s opening night featured Missing, a film by Costa-Gavras. The film followed the disappearance of American journalist and filmmaker, Charles Horman, and the events surrounding the American-backed 1973 Chilean military overthrow. Thursday’s screening came 30 years after Missing was first filmed and 40 years after Horman’s disappearance. CFI Executive Director Tom McSorley said the festival’s blend of domestic and foreign programming reflected his organization’s mandate to promote films as educational and a tool for cultural exchange. Also on the festival schedule was Canadian director Alanis Obomsawin’s Hi-Ho Mistahey!, a profile of Aboriginal education opportunities at Attawapiskat, which premiered at this year’s Toronto International Film Festival. Other international films being featured as part of the three-day showcase include Italian director Peter Marcias’ My Destiny, Jeff Roy’s Mohammed to Maya and Barmak Akram’s Wajma: An Afghan Love Story. In the collaborative process of planning the festival, the CFI brought its curative expertise and increased exposure to non-commercial film, while the University of Ottawa used its connections with guest speakers and NGOs as well as the screening venues at its disposal. One of the goals of this process was to create a forum for discussion through film, a factor McSorley said is especially important for this festival because of the increased exposure given to human rights issues that are often unknown to the public. “The idea of concentrating on the ideas surrounding human rights that are more specific, you know, their preservation, their enforcement, their creation… that became a very exciting idea,” he said. McSorley said the CFI last hosted a similar human rights film festival at the National Arts Centre in the late ‘90s at a time when the break up of Yugoslavia caused mass political unrest and resulted in human rights abuses..
Human rights struggles still continue today and deserve to be exposed to the public, he added. “The time is always now for human rights films,” McSorley said.